CREDIT: Ian Lindsay, Vancouver Sun George Wong, of Platinum Project Marketing, has sold $430 million in product so far in 2005. Think B.C.’s high housing prices are on the verge of a major correction? Think again, according to an economic forecast released Wednesday by the Credit Union Central of B.C. B.C. houses are predicted to fetch higher prices and sales volumes are forecast to increase both this year and in 2006, driven by low mortgage rates, rising in-migration, robust economic growth and improved consumer confidence. Pastrick’s forecast update for 2005-2006 noted that after a brief dip a sellers’ market has returned in full force. Residential MLS housing sales are predicted to rise by seven per cent in 2005 to 103,400 units and by five per cent in 2006 to 109,000 units, setting a record in each year. Housing prices are also forecast to rise about 10 per cent this year and eight per cent in 2006, resulting in an average B.C. price of $342,000 in 2006. In Greater Vancouver, prices are expected to rise from an average $373,877 in 2004 to $400,000 this year and $425,000 in 2006. In the Fraser Valley, prices are forecast to rise from $293,420 in 2004 to $310,000 in 2005 and $330,000 in 2006. New housing construction is predicted to reach 34,800 units during 2005, up from 32,925 in 2004. Next year, housing starts should increase to 37,000 units in response to higher sales and prices. Pastrick added that B.C. housing activity has been on the upswing for nearly five years, but there’s still room for growth. “All markets undergo some correction at some point, but it’s not there yet,” he said. George Wong of Platinum Project Marketing, the marketing arm of Macdonald Realty, said the forecast is no surprise to him. Wong said he began selling suites in the upscale Two Harbour Green tower in downtown Vancouver last month and that it’s almost sold out — at an average price of $2.5 million per suite. The forecast also said that rising land and construction costs will drive new housing prices higher. As well, more in-migration will push down the rental vacancy rate, despite more new rental supply coming on the market and more renters buying homes. The market vacancy rate is forecast to decline slightly to 2.3 per cent by October and to 2.0 per cent a year later. All regional markets are expected to post gains in housing activity, although some markets were late seeing gains due to a weaker local economy and less population growth. Those areas are now poised to record greater percentage gains than the larger urban markets, the forecast noted. Pastrick noted that another factor that can contribute to a market downturn is a large amount of speculation, something that isn’t happening at the moment. “Demand has been driven by sound fundamentals — the purchase of homes as residences or for long-term investment,” he said. The survey noted that less than four per cent of purchases were bought for speculative buying — defined as properties being resold six months or less after purchase. That compares to 10 per cent at the peak of the last strong market upturn, which ended in 1990, and to over 20 per cent in 1981, when there was a price bubble. However, the survey said that speculative activity is a natural consequence of a hot market and is expected to become proportionately larger until the market turns down. As well, the Credit Union Central forecast also said that higher employment levels indicate that the construction industry is expanding, along with the number of firms. When Vancouver held the Habitat For Humanity conference in 1976, Imelda Marcos defended her dictator husband’s slum-clearance program in the Philippines, Mother Teresa pleaded for the world’s poor, Canadian prime minister Pierre Trudeau decried “the recklessness we have displayed toward nature” and his wife Margaret demanded “action, not promises” on cleaning up the world’s water supply. The African National Council of Zimbabwe attacked apartheid in South Africa, the head of the Soviet delegation joined in a walkout led by the Palestine Liberation Organization to protest Israeli settlements on Palestinian land, and legendary architect R. Buckminster Fuller delighted schoolchildren with a positive vision of the future. Not so positive, perhaps, as that of U.S. social scientist Dr. Magoroh Maruyama, who declared at Habitat that 10,000 people could be living in outer space by 1990. Next year, Vancouver hosts the third World Urban Forum, dubbed Habitat+30, but its focus is likely to be a whole lot narrower than that of the first Habitat. The world’s urban areas face enormous pressures on so many fronts that Habitat+30 must eschew debate on world peace and space colonies to deal with such mundane but vital issues as sewage treatment, transportation, housing, infrastructure and land use. 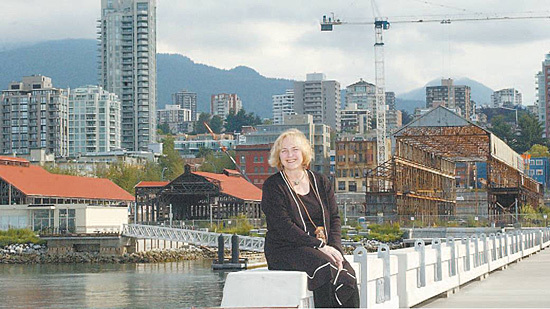 North Vancouver Mayor Barbara Sharp is director of the International Centre on Sustainable Cities. Earlier this month she took part in Financing Smart Growth, an all-day forum at the Hilton Metrotown focused on finding a sustainable balance between business interests and community needs. North Vancouver is a prime example of the changes being made across the Greater Vancouver Regional District in a bid to channel growth. The SeaBus arrived at Lonsdale Quay in 1977, followed by the market and hotel in 1986, and an initial burst of business interest that saw ICBC relocate there. But it’s only after years of stasis that a genuine sense of momentum has finally hit the neighbourhood. Condo projects are popping up all around Jack Loucks Court — a new park located on Second Street between Lonsdale and Chesterfield — and on the waterfront, the Versatile Shipyards, closed in 1992, are being prepared for major residential and retail development. The GVRD not only has its head office in Metrotown but was a pioneer in bringing jobs to the neighbourhood when it moved there in 1980. Today, Metrotown has the region’s most complete mix of residential, retail and office uses outside central Vancouver, and GVRD regional development division manager Chris DeMarco says about 30,000 people now live within walking distance of the jobs in Metrotown. It’s something the GVRD also wants to see occur in its other designated regional town centres in Maple Ridge, Surrey, Richmond, New Westminster, Coquitlam, Langley and Lonsdale. 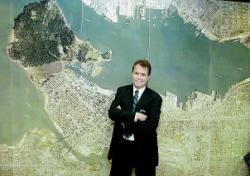 In New Westminster, retail growth is a key concern of Tim Whitehead, the city’s director of development services. On the residential side he’s enjoying the renewed interest that will see, among other projects, five towers, each over 30 storeys, along the Fraser River. But no amount of residential redevelopment can yet help Columbia Street, which was once a major shopping hub and home to a number of department stores but is now down at heel and blighted by truck traffic. Whitehead wants the trucks shifted so they’re out of sight along the railway tracks, with much better pedestrian links between Columbia and the waterfront. But RAV stations at Richmond Centre, Alderbridge and Cambie will boost development to the point that Richmond’s traditional car-oriented shopping centres, described by Carter-Huffman as “amorphous buildings floating in a sea of parking,” will have to adapt to higher density. She notes that this is already happening at the site of the Cambie station, where the newly revitalized Aberdeen Centre has a much higher density than its predecessor. A design feature unique to Richmond is readily apparent to anyone flying out of YVR who gazes down on the city’s small towers, restricted in height by airport flightpath requirements. Each building sits atop a podium, and each podium has a garden, putting green or other green amenity. Richmond isn’t the only autooriented community to see development shifting toward the edge of the road and away from oceans of cars. The GVRD’s DeMarco notes that even in car-crazy Langley, single-family areas have been rezoned for higher densities. “Most councils are afraid to do that,” she says. In fact, it’s individual municipal councils that stand in the way of progress on one of the most egregious examples of sprawl faced by the region. Office parks are a boon for businesses seeking space at a far cheaper price than that paid in downtown Vancouver or regional town centres, and developers find them just as inexpensive to build. But they’re the bane of planners, who have a list of complaints about the sprawl of small buildings: They’re usually built far from transit, causing a kind of taxation on employees forced to maintain a car in order to commute, and are often deficient in retail outlets, restaurants and other public amenities. Cheeying Ho is executive director of Smart Growth B.C., which hosted the Financing Smart Growth forum on June 17. Ho says business parks should be built as complete communities tied in to transit, with development cost charges changed to encourage sustainable development. Ironically, notes DeMarco, “some economists are saying that with our forecast labour shortages, employers have to be more careful about providing all the amenities they can to their employees. The proof of the pudding is in the tasting, and no one is savouring a bigger banquet than North Vancouver Mayor Sharp. She says her municipality is enjoying a raft of benefits from paying close attention to development issues, as when the city reduced some road widths and sold the extra land to developers. Then there’s the Lonsdale Energy Corporation, a district energy system installed in pipes as streets and sites were being torn up in lower Lonsdale. As the city describes it on its website, “the LEC district energy system produces hot water at a series of mini-plants within Lower Lonsdale and then distributes the hotwater energy through underground pipes to buildings connected to the system. Once energy is used in the connected buildings, the cooler water is returned to a mini-plant, reheated and circulated back to the connected buildings.” Five major buildings are now connected to the LEC district heating system. Another success story has just started with the first stretch under construction along West Keith Road of what will be a seven-kilometre “green necklace” path for pedestrians, cyclists, in-line skaters and people in wheelchairs. It, too, was funded by the sale of some city land holdings. Sharp says an odd problem the city has with its ambitious plans is the curse of NIMBY — the “not in my back yard” syndrome. There’s also opposition to allowing single-family homes to have secondary suites above a garage, dubbed coachhouse development. Another NIMBY issue is noise. “I think that some people going into condos come from singlefamily homes, and it’s not the same thing,” says Sharp. Queen of Oak Bay Looses Power … Hits Wall – doc. …the vessel experienced an engine problem docking at Horseshoe Bay. A dramatic accident at Horseshoe Bay Thursday in which a 7,000-tonne ferry apparently lost power and plowed into a marina could have been far worse had it not been for the quick thinking of the ferry’s captain, according to a Canadian Coast Guard official. BC Ferries’ Queen of Oak Bay collided with Sewell’s Marina around 10:10 a.m. Thursday and ran aground — destroying several pleasure boats, including about half a dozen that sank to the bottom of the bay, and stranding 544 passengers on board for more than six hours. The cause of the collision is still under investigation by both Transport Canada and the Transportation Safety Board. But initial reports suggest the vessel lost engine power as it neared the terminal. “Typically when they come in, they shift into reverse in order to slow down,” said Tebb. However, with those reverse thrusters disabled, said Tebb, the ferry was in danger of slamming into the terminal, with disastrous consequences for both passengers on board and those on shore. “Obviously, they did an avoidance to not slam right into the dock,” he said. Witnesses said the ferry began sounding its air horn repeatedly while it was still several hundred metres from the terminal — leading many to believe at first that another boat was in its way. “It was like somebody with a car horn just holding it down,” said Sara Brocklehurst, who was getting an ice cream cone while she waited for the ferry. After two or three minutes of sounding its horn, the ferry slowly crashed past the marina’s breakwater and then into several rows of boats. While no one on the ferry was injured, its passengers were stranded for most of the day — unable to leave the ferry while divers searched the waters below to ensure no one was trapped underneath. Finally, around 5 p.m., the ferry was towed to its berth and passengers were allowed to depart. Susan Tapp of Courtenay was one of the passengers who walked off. Bob Walker, who was waiting to board the ferry, said the massive vessel simply rolled over many of the large sailboats in its path. “The masts just snapped over like twigs as it came in,” he said. Tracey Morettin, who was on the beach with her children, said passengers on the ferry’s car decks appeared to realize something was wrong and were yelling at people in the marina to get out of the way. As it advances, the ferry pushes into a fleet of smaller craft. The Queen of Oak Bay continues on its crash course. The ferry comes to a halt after crunching several boats. The ferry goes out of control while the captain tries to dock. Mike Bromley’s 11.5-metre charter sailboat was one of those crushed by the ferry. “My business is toast this season,” said Bromley, who wasn’t at the marina at the time of the accident. The crash took place during one of the busiest weekends of the year for BC Ferries and resulted in the cancellation of several sailings out of Horseshoe Bay and congestion on other routes. “We have no choice but to wait,” said Lasqueti Island-bound passenger Jan Rae, who was supposed to board the Queen of Oak Bay at 10:30 a.m. and was still waiting in line several hours later. BC Ferries president David Hahn said the company will do its best to add extra sailings over the weekend to make up for having one of its vessels out of commission, but admitted things will be tough for travellers. Hahn said the Queen of Oak Bay will be placed in dry dock and inspected to try to determine what happened. “It won’t go back in the water until it’s clear what went wrong,” he said. The ferry, which was built in 1981, was put back into service just 17 days ago after undergoing a $35-million refit of its lifesaving equipment, passenger accommodations and engine. However, Hahn said Thursday there is no indication that the refit had anything to do with Thursday’s collision. “There was work done on a number of issues in the engine room but I can’t correlate any of that to what happened today,” he said. – Are refunds being given for reservation fees? Yes. B.C. Ferry Services is automatically refunding all reservation fees for Friday sailings between Horseshoe Bay and Nanaimo that were scheduled to depart after the accident. – Will ferry reservations be honoured today? Yes, reservations between Tsawwassen and Swartz Bay will be honoured, but BC Ferries will not be taking last-minute reservations for that route today. On the Horseshoe Bay to Nanaimo route, reservations will be honoured only if BC Ferries is able to bring in a replacement vessel. It was not clear Thursday evening whether a replacement ship would be available. July 2003 — Four passengers suffered minor injuries when the Spirit of Vancouver Island collided with its dock at Swartz Bay. The accident caused tens of thousands of dollars of damage to the dock and the ship. May 2003 — The Queen of Surrey was taken out of service for two months after an engine fire. No one was injured, but 318 people were stranded. September 2000 — Two Americans were killed when their 10-metre yacht collided with the Spirit of Vancouver Island near Swartz Bay. AUG. 9, 1979: The Queen of Alberni ran aground near Sidney, damaging vehicles it carried. Officials watch divers searching the water beneath a pleasure boat crushed by the Queen of Oak Bay at Horseshoe Bay on Thursday. A man relaxes while watching crews work on the Queen of Oak Bay after it ran aground. Frustrated travellers sit stranded on the tarmac of the Horseshoe Bay ferry terminal. The terminal was shut down while scuba divers entered the water to search for survivors and survey damage to the boat. August 1992 — A mother and her two daughters died when their van plunged off a ferry loading ramp at Nanaimo. March 1992 — The Queen of Alberni collided with a Japanese coal carrier in thick fog off Tsawwassen. Eighteen people were taken to hospital. February 1992 — The Queen of Saanich collided in the fog with a catamaran operated by Royal Sealink Express, injuring 23 people. December 1991 — The Howe Sound Queen collided with a dock at Horseshoe Bay. Six passengers were taken to hospital. June 1989 — The Queen of Alberni crashed into a dock at Departure Bay, injuring six passengers. August 1985 — The Queen of Cowichan crashed into a family’s pleasure boat off Bowen Island, killing a mother and her two sons. October 1984 — The Queen of Surrey smashed into the side of the Horseshoe Bay dock, causing $200,000 in damage to the dock. August 1982 — The Queen of Prince Rupert was heavily damaged when it ran aground near Bella Bella. August 1979 — The Queen of Alberni ran aground in Active Pass. There were no injuries, but there was extensive damage to trucks and automobiles on board. October 1971 — A car carrying an elderly couple plunged off the Queen of New Westminster at Departure Bay when the ferry lurched from the ramp while being unloaded. The occupants of the car were saved by two bystanders. August 1970 — A heavily loaded Russian freighter sliced into the side of the Queen of Victoria, killing three people. The accident happened in Active Pass, between Galiano and Mayne Islands. The Queen of Oak Bay ran aground just two hours past low tide. The afternoon high tide, though not nearly as high as the nearest nighttime highs, was enough for the vessel to be freed. Data below plots Thursday’s high and low tides. Posted in Other News Articles | Comments Off on Queen of Oak Bay Looses Power … Hits Wall – doc. Initial architectural image of the proposed CBC development. One of Vancouver‘s most distinctive — perhaps most reviled — buildings is about to undergo a major redesign. The Canadian Broadcasting Corporation’s “media factory” at Georgia and Hamilton streets is being re-imagined by one of Canada‘s leading green architectural firms, Hotson Bakker Boniface Haden. The project is a partnership between the CBC and Concord Pacific, the Vancouver developer responsible for most of the condo towers lining the north shore of False Creek. Concord Pacific is planning to build two residential and retail towers on the Robson side of the property, while CBC wants to create a building that will take it “into the Olympics and beyond,” said Ralph Segal, Vancouver’s senior development planner. “They want a far more prominent venue for their broadcasts,” Segal said. The initial plans for the project were sent back to the drawing board earlier this month by the city’s urban design panel. The project’s architects will return to the panel next month for a second presentation. The CBC building was built in the 1970s and designed by architect Paul Merrick, who won a governor-general’s award for it. But its severe lines and factory-like appearance have not been popular with everyone, and Segal said Wednesday the panel is not committed to preserving the “bunker-like structures” that house some of the broadcasting studios on the property. “Frankly, we’re not so enamoured of those bunkers that we wouldn’t want to see them encompassed or surrounded by something more esthetic and more active,” Segal said. According to the minutes from the panel’s June 8 meeting, architect Joost Bakker explained the CBC is going through a “major cultural change” in respect to the relationships it holds with Canadian communities. Bakker said the original metaphor for the building was a “media factory,” and the new proposal aims to make the building more visible. Bakker was not available Wednesday for comment, but Segal said the CBC wants to make its broadcast studios visible from Hamilton Street. On the Robson Street end of the property — where there is now a parking lot — Concord Pacific plans to build two residential towers with stores at street level. 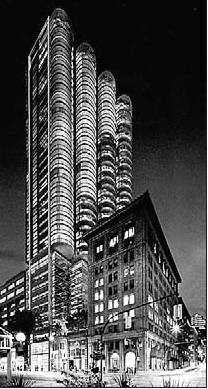 Architect Walter Francl is designing the towers for the developer. Concord Pacific will not buy any part of the property, but will have a long-term lease arrangement with the CBC, Segal said. Overall, the urban design panel — which includes architects, an engineer, a developer, a planning commissioner, and a landscape architect — liked the plan, but had concerns about specific elements, such as a proposal for townhouses along Hamilton Street and the level of sustainability. One panel member said although the CBC’s is not a beautiful building, it should be treated in a manner that allows it to “stand proud” on the Cambie Street side, according to the meeting minutes. There are others with a similar fondness for the building. “There are those who believe it should be put on our recent landmark heritage list because it’s expressive of a certain style of architecture,” Segal said. Restaurant Appraisers & Equipment Auction Houses – doc. When it comes to food equipment, Jerry Wowchuk knows his stuff. After years in the service and repair end of the food equipment business, Jerry turned his attentions to auction­eering. He and his wife Charlene figured the Lower Mainland was ready for an auc­tion house specializing in quality new and used food equipment . Jerry attended the renowned Repperts School of Auctioneering in Auburn, Indi­ana and became an Auctioneer and Certified Appraiser before starting Kwik Services. Everybody loves a bargain, especial­ly in the restaurant business where staying afloat is not an easy thing. Serious amateur chefs also appreci­ate the durability of professional equip­ment, as well as the money saved of course. Jerry figures savings at Kwik are somewhere between yo and 6o per cent and much more in some cases. er combo and a sandwich/pizza con­veyor oven.Other items included: pani­ni grills, new 20 and 30 quart Uniworld mixers, coffee machines, sausage stuffers, four and six burner ranges and convection ovens, soft serve yogurt machines, restaurant chairs and booths, new countertop broilers and griddles, cash registers, cookware etc., etc. In other words everything you need to set up a restaurant – except the staff – and the capital. “The key to this business is to main­tain a lot of inventory and offer sev­eral items in each category,” says Jer­ry. Consequently he spends a lot of time buying. Helping companies liquidate is a huge part of Kwik’s business. “We strive to find new ways to get customers the most money for their surplus equipment,” says Jerry. Integrity before profits is the com­pany motto. For 25 years Able Auctions has been saving consumers money – some-times substantial amounts. Because there are no reserve bids (except on some autos), savings for some lucky bidders can be up to 95 per cent. The company conducts 15 to 20 auctions per month featuring every-thing from autos to notebook com­puters to building supplies. Able also specializes in police recov­ered items. “We probably sell more bicycles than any retailer in B.C,” Dodd says. There are three permanent Lower Mainland locations, as well as two on the Island, one in Calgary and one in the Okanagan beginning this summer. Able Auctions’ Vancouver location is the only Auction facility in the Province dedicated to the sale of office furniture. new computer systems, more than 500 monitors, more than ~ooo office chairs, more than 250 desks, more than 250 file cabinets, more than too photocopiers and countless other office related items. This one facili­ty sells more office furniture and equipment monthly than all other auction houses in the Province sell combined annually. All office auctions from this loca­tion are broadcast live over the inter–net with typical participants bidding from Vancouver to San Francisco and recently as far east as Kentucky. Much of the merchandise offered at Able Auctions is new, or in the case of vehicles, well-maintained. “I don’t think people fully realize the quality of the products that we sell,” says Dodd. With decades of combined experi­ence in the auction industry, the knowledgeable staff is eager to assist you with both buying and selling at the auction. Able works on behalf of most local hospitals, municipalities, the GVRD and several charities. The company is a major supporter of charities including the Cystic Fibro­sis Golf Tournament and the CKNW Orphan’s Fund. From A to Z for work or pleasure, Able Auctions has been in the business of saving consumers mon­ey for 25 years. The company conducts 15 to 20 auctions per month featuring everything from autos to notebook computers to building supplies. With decades of combined experience in the auction industry, the knowledgable staff is eager to assist you with both buying and selling at the auction. Posted in Other News Articles | Comments Off on Restaurant Appraisers & Equipment Auction Houses – doc. Artist’s graphic offers impression of the Foster ‘footprint’ on Vancouver. The internationally-acclaimed architectural firm of Foster and Partners is about to put its design footprint in downtown Vancouver in the shape of a spectacular, glazed, 37-storey retail-office-condo tower at 848 West Hastings. It will be the London, U.K.-based company’s first foray into Canada. Foster has worked on some of the world’s landmark buildings including the Great Court at the British Museum, the new German Reichstag in Berlin, Hearst Tower in New York and the Hongkong and Shanghai Bank headquarters in Hong Kong. “A Norman Foster building will not be just a Vancouver landmark but a world landmark,” said Bob Rennie of Rennie Marketing Systems who will market the project. The $175-million development is the brainchild of the Jameson Development Corp. a private Vancouver company. One of its more prominent projects has been the redevelopment of the historic Shaughnessy Mansions at Granville and 15th Avenue. Scheduled to go into the ground next spring, the yet-to-be-named tower will incorporate two heritage buildings and sit in the middle of the city’s newest heritage-block designation, stretching from Burrard to Richards along West Hastings. The 1929 Ceperley-Rounsfell Building and the former Chamber of Mines Building — originally The Royal Financial Building — will be preserved and incorporated into the overall development. The Ceperley building will be fully restored with its front and rear mezzanine floors being returned to their original shape. The facade of the Chamber building will be retained. Apart from its spectacular looks, the building will be a showcase for sustainability and energy efficiency. For example, it is expected to use the same energy as an office building one-third its size. Featuring three floors of retail, eight storeys of commercial and 25 storeys of condominiums, it will be the the most environmentally sensitive building in the city, Rennie said. There will be approximately 132 suites and four penthouses with prices ranging from $450,000 to $4 million. Bidding wars and line-ups of buyers are not just for the Lower Mainland condo market anymore, as British Columbia‘s recreational properties are increasingly in demand. In the South Cariboo, people are lining up for properties, Brad Potter, a realtor in 100 Mile House, said in an interview. And several are being sold above their asking price. Potter blames the rush on baby boomers who are looking ahead to retirement within a few years. Prices are rising with almost every new listing, he said. What makes the South Cariboo so attractive is that it remains affordable, according to a report issued Tuesday by Re/Max. The most sought-after properties are those priced between $150,000 and $300,000. That has put a lot of pressure on the South Cariboo and the Sunshine Coast, the report said. Where 100 Mile House and the Cariboo have an advantage is price point, Elton Ash, regional vice-president of Re/Max Western Canada, said in an interview. People are willing to travel the extra 30 minutes or an hour to take advantage of cheaper pricing. Recreational properties on the higher end of the spectrum are feeling less pressure, especially in markets in Ontario, the report said. But prices in B.C. are likely to continue to climb. The Alberta influence is also affecting the B.C. market, Ash said. “Here in the Okanogan all the way to Tofino, there is a lot of interest from Albertans because a lot of money is being made in Alberta right now,” Ash said. And as the number of millionaires in Canada grew 8.3 per cent last year, many from Alberta and B.C., that means there’s more money to spend on lifestyle, Ash said. Sunshine Coast realtor Rob Jardine said prices in his neck of the woods have increased 10 to 15 per cent in the past year, with an oceanfront home costing on average about $800,000, while property on the nearby islands are about $550,000 to $600,000. Properties on Ruby and Sakinaw Lakes are so in demand that they don’t even hit the market. Although high prices have slowed down demand slightly on the coast, a 28-lot development on Gambier Island was sold out in about a day with prices between $160,000 and $280,000, Jardine said. Its mainly baby boomers from Vancouver that are buying, Jardine said. The Re/Max Recreational Report covered close to 50 major centres throughout Canada. Prices in Ontario, the most desirable cottage property in Canada with 5 million people in the Greater Toronto Area trying to escape the humidity of Toronto each weekend, has levelled off as the western provinces from Manitoba to B.C. experienced unabated price increases, the report said. According to the report, a 3-bedroom waterfront home in Whistler or Salt Spring Island tops $1 million while the same property in Tofino, Ucluelet, Penticton or Vernon would be $500,000. The only western recreational destination in the $500,000-plus club outside B.C. is Sylvan Lake, Alberta. CREDIT: Mark van Manen, Vancouver Sun Shirley Clarke has been North Vancouver’s top-selling realtor for the past five years. Shirley Clarke is a former stay-at-home mom who started selling houses in 1997 when the B.C. real estate industry was experiencing one of its periodic downturns. 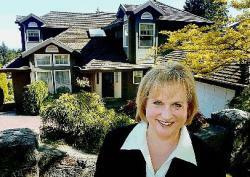 While many of her contemporaries have left the business, unable to make a steady living, she has, one listing at a time, become North Vancouver‘s top-selling realtor for the past five years. In each of the past two years, Clarke has sold 150 homes. At a typical commission of $20,000, that’s a potential $3 million in gross annual income, less expenses and shared commissions. Clarke is not the only B.C. realtor raking in the cash from an industry that traditionally operates under the 90-10 rule, which says that 90 per cent of all sales are made by the top 10 per cent of realtors. Residential sales topped $27.8 billion in B.C last year. That’s more than double the $11.9 billion recorded five years ago when fewer than 14,000 agents were registered to sell real estate in the province and about 100 were quitting the business every month. The number of licensees bottomed out at 12,619 in December 2001, according to the Real Estate Council of B.C., and has been climbing ever since. At last count there were 15,639 eager to buy or sell your home. The chances are many of them will have fallen by the wayside five years from now, despite a housing market that is fundamentally sound for the foreseeable future, particularly in Greater Vancouver which accounted for $13.8 billion, or half of total residential sales last year, and where 7,885 licensees, or half the total, operate. The average realtor sells a mere 10 houses a year and it is a much tougher business than many people assume, Clarke says. “I think a lot of people are under the illusion that it is an easy job and it looks like a lot of money because on any given house in North Vancouver you are looking at a $20,000 commission cheque usually, and that sounds like a lot of money. Clarke’s expenses swallow 50 per cent of her income and she works 80 to 90 hours a week. She maintains her own office in sought-after Edgemont Village and employs a staff that includes husband John, a former commercial realtor, and 27-year-old daughter Laura, a former teacher. Clarke sees her office as a year-round advice centre, helping her neighbours with questions about their property assessments and the like, in the hope that her name will be top of mind when they want to buy or sell. Her marketing is reinforced by a top-flight website, copious print advertising and community-wide mailouts of notepads and calendars adorned with the Shirley Clarke logo. Nowadays, 75 per cent of buyers use the Internet, mostly on weekday evenings, to see what’s new and check out the details. She says traditional weekend open houses are becoming less important as a source of buyers. Clarke also raises her profile by supporting local charities, and is currently campaigning to raise $10 million toward the cost of a new emergency room at Lions Gate Hospital. An industry joke says that realtors retire when they become listless but with the average practitioner aged 50-plus, real estate clearly offers openings for young people. “People with sales experience would be expected to do well but the proof is in the pudding and some will do well and some will not,” said Georges Pahud, president of the Real Estate Board of Greater Vancouver. The market is also settling down, as indicated by slower price growth, says Tsur Somerville, director of the Centre for Urban Economics and Real Estate at the University of B.C.‘s Sauder School of Business. Real estate is a vital sector of the provincial economy, worth an estimated $30 billion when commercial and industrial sales are added to the mix, and that’s without tallying the value of the booming construction sector. While it is a mistake to think home prices will go up forever — prices in Vancouver failed to keep pace with the cost of living between 1995 and 2001 and we’re already four years into a typical six-year growth cycle — Somerville says anybody buying today and prepared to stay put for at least five years will, nine times out of 10, recoup their transaction costs and be better off than renting. Helping to sustain the Lower Mainland market are relatively low interest rates, increased job growth and in-migration coupled with rising wages, as well as the residue of pent-up demand that welled up in the late ’90s, says Cameron Muir, senior market analyst with Canada Mortgage and Housing Corp. in Vancouver. The Vancouver Olympic Organizing Committee and some of its venue partners will get some $358.8-million worth of construction work underway this year as they begin building the facilities for the 2010 Winter Olympic Games. That construction, however, will be just the tip of the iceberg in terms of the economic impact of the games, which is estimated at between $5.8 billion and $10 billion. Olympics often act as “catalyst events” that accelerate the construction of long-desired pieces of infrastructure, said Dave Williams, director of tourism policy and research at Simon Fraser University. In the case of the Lower Mainland, winning the 2010 Games helped spur development of the $1.7-billion Richmond-Airport-Vancouver rapid transit line and the $565-million expansion of the Vancouver Convention and Exhibition Centre. However, there is an organization working to make sure that the legacy of the Olympics will be measured in more than thousands of construction jobs or in tens-of-thousands of new visitors as the B.C. business sector boosts its tourism marketing to the world. 2010 Legacies Now is a provincial non-profit society created with the intent of forming partnerships with communities to create sustainable legacies. “I hope we realize the importance of community through our [Olympic] Games,” said Marion Lay, president and CEO of 2010 Legacies Now. Lay said sport and recreation were the organization’s focus when it was formed, but its mandate was expanded when it started working with volunteer community groups under an initiative called Spirit of B.C. Those community committees, she added, wanted to see the Olympics used to foster development of the arts and culture, literacy and volunteerism. Lay said Legacies Now is focusing on volunteerism because the Games will need an army of capable volunteers to stage the events, but she also wants to see that spirit of volunteerism transform the province into a culture of a more involved citizenry that takes a more active involvement in its communities. And Lay wants to make sure businesses are a big part of that. “We know if you want to have more skilled employees in any region of the province, [people] are going to look at [B.C.] and ask ‘is this a good place for my family,'” Lay said. “And that makes a difference in where businesses decide they’d like to relocate or like to start up,” she added. In the meantime, B.C.-based building contractors will likely put up stiff competition to build the Olympic venues, despite the unprecedented building boom in the province, said Keith Sashaw, president of the Vancouver Regional Construction Association. To date, Vanoc has let contracts for site preparation of the $55-million sliding centre — the bobsleigh, luge and skeleton venue — and site access construction for the $102-million Nordic ski venue in the Callaghan Valley. Vanoc expects to tender the remaining work on those venues later this year, along with the first phase of $10.8 million in renovations to Cypress Mountain‘s facilities for freestyle skiing and snowboarding events and $23 million in work at the Whistler Blackcomb ski resort for the alpine events. Also, the University of British Columbia anticipates starting on construction of the $40.8 million winter sports complex that will be used for hockey events while the city of Richmond will begin on the design-build process for the $127 million speed-skating oval. “There is a certain cachet about being involved in Olympic projects that will attract a lot of initiatives among contractors bidding for the jobs,” Sashaw said. Benefits from the 2010 Olympics are beginning to flow. CREDIT: Bill Keay, Vancouver Sun Vancouver expects 90,000 more people and Larry Beasley, the city’s co-director of planning, says land for redevelopment is filling quickly. Vancouver sees itself accommodating a population of up to 635,000 by 2021, an increase of almost 90,000 residents, in a city where available land has been fully developed for some time. Larry Beasley, co-director of planning for the city, says available land for redevelopment is filling quickly. The challenge is to create more intensive high-density housing in a way that appeals to potential buyers and maintains the carefully choreographed urban structure the city has created, but doesn’t impinge on the “support areas” of the city — the downtown office core, zones for retail trade or commercial activity — that are vital to economic development. “It’s a fine balance for us,” Beasley says. The city has put a moratorium on the conversion of commercial and office space in downtown’s core business district into condominium sites, and the city is in the midst of evaluating Vancouver’s economic growth trends to deduce its needs for land allocations to maintain commercial growth. The major challenge for Fraser Valley Regional District planners is a conundrum: How does it accommodate a doubling of the region’s population and protect its critical agricultural sector when the property that is considered habitable is also the most fertile. The FVRD comprises 14,000 square kilometres of fields, hills and forests. Highly productive agricultural lands, however, cover only 5.4 per cent of the overall land base. Some 90 per cent of the region’s population (237,500 in 2001) lives on only one per cent of the region’s overall landscape, which will have to squeeze in another approximately 212,500 by 2030 (a total of 450,000). “The communities of the FVRD are committed to responsibly manage future growth,” said Hugh Sloan, the regional district’s director of planning. The regional district recently adopted a new growth strategy that identifies urban growth boundaries designed to contain the majority of population and employment growth over the next 20 to 30 years. Growth is concentrated in the urban centres of Abbotsford, Chilliwack and Mission where 89 per cent of the Valley’s residents live. The regional district’s demography has also changed. The typical valley resident is now a 40-year-old, whereas he or she was 16 in 1971. The challenge, Sloan said, is answering the questions of where the next generation of workers will live and how they will travel between work, home, daycare, hockey practice and band recital. The Greater Vancouver Regional District’s vision for the future is complete, community-scale “town-centre” developments, focused in Surrey, Coquitlam or Vancouver and located on the major public transit links to ease pressure on the region’s ecological jewels such as the North Shore mountains and wildlife-rich Fraser River estuary. It has to be, says Johnny Carline, the regional district’s chief administrative officer. The GVRD’s Livable Region Strategic Plan characterizes the region’s early development as low-density sprawl — lots of single family homes spread out over a wide area. The legacy of that, however, is growth-stifling traffic congestion. Carline adds that the GVRD is in the process of updating the plan, first released in 1999, to make sure it measures up with its membership municipalities in promoting compact communities where people can live work and play without enduring crushing commutes. Carline says the region has done well at defending the “green zones” — he call them environmental jewels. And its transportation initiatives — the RAV line and Coquitlam light-rail project — are the right projects, if a little late, to help ease congestion. The region has failed, however, at creating those contained communities where people live close to where they work. Carline notes that over the last 10 years, of the eight million square feet of office space built in the region outside of Vancouver, only one million square feet of that was built in defined town centres. Growth will be a challenge for the city of Surrey as it tries to accommodate the approximately 1,000 new residents moving into its borders every month, but a burgeoning population isn’t its biggest challenge, Mayor Doug McCallum says. “The biggest challenge we have, in my mind — and it is a priority in the city — is to create jobs,” he added. Surrey, for a long time, has served as a suburb to Vancouver and bedroom community for other municipalities where industry is more heavily concentrated. McCallum said the result has been an “80/20” live/work ratio, which means only 20 per cent of Surrey‘s residents work in the municipality. The city is aiming to shift that to a “60/40” ratio, where almost half of Surrey‘s people work within the community where they live. To do so, however, means attracting 170,000 new jobs over the next several years. McCallum noted that the city’s own expansion helps sow the seeds for growth in its workforce. Builders are experiencing shortages of personnel in the building trades — framing carpenters and plumbers, for instance. He added that Whalley is an example where the city is successfully urbanizing itself. The neighbourhood is home to Central City, which includes Simon Fraser University‘s newest satellite campus and a total of one million square feet of office space that has been entirely filled. McCallum said his council has also approved the construction of eight new residential highrise towers, including one right next to a SkyTrain stop. The city, in turn, is working hard at building its social infrastructure. Two or three new schools are being built, major additions to the city’s hospital have been planned, Kwantlen University College is building a new campus in Surrey‘s Cloverdale area and the city is buying up large tracts of land to turn into parks, the mayor said. You are currently browsing the Les Twarog Vancouver Real Estate and Condo Blog blog archives for June, 2005. Bad Behavior has blocked 2112 access attempts in the last 7 days.